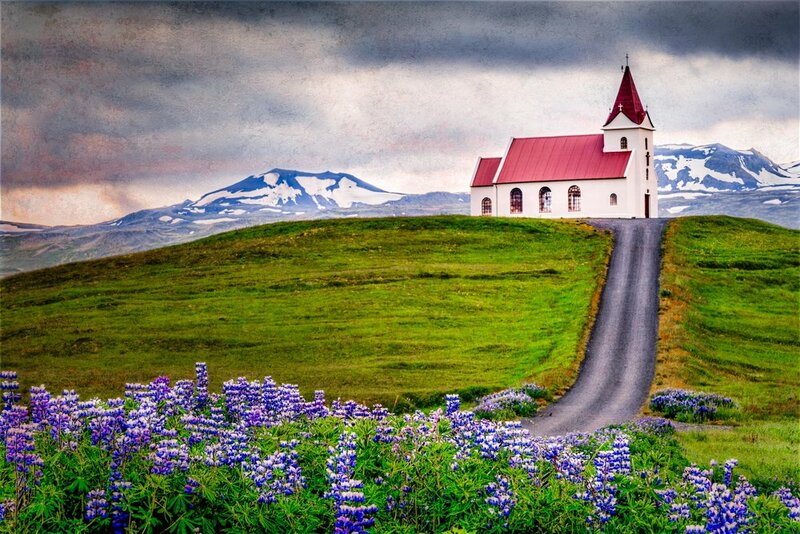 The Ingjaldsholl church, on the tip of the Sna¦fellsness peninsula in Iceland, is situated between the towns of Rif and Hellissandur. The views, including the historic church on the hill, the Alaskan Lupine flowers that cover Iceland in July, and the spectacular jagged coastline, are magnificent in every direction. The Icelandic Vinglundar Saga mentions this prayer chapel as early as 1317 and, according to legend, Christopher Columbus visited in 1477 to study the journeys of Nordic sailors and gain additional information about their travels to North America. The current church is the oldest concrete church in the world, having been built in 1903. Driving at night because summer sunsets and sunrises are only a few hours apart, I simply could not resist the allure of the church with the spectacular Sna¦fellsjokull glacier behind and the brilliant purple flowers in front. I especially wanted to capture this peaceful and quiet moment of solitude at 2:00am, which was made possible by the wonderful, and surprising, amounts of Icelandic summer light.